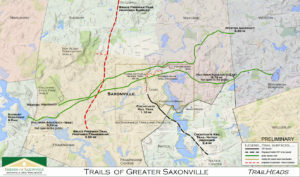 In April 2016, the Friends of Saxonville launched a new committee named the "TrailHeads" which is dedicated to the trails of all types in the Saxonville area. The committee includes several members of the Cochituate Rail Trail (CRT) committee. Because the CRT is essentially done and open, and because the Friends of Saxonville is already involved in the area trails, the Friends wanted to combine the experience and talents to continue the efforts to develop quality recreational trails. The FOS "TrailHeads" Committee promotes public awareness and use of recreational trails in the area. While coordinating with Framingham Department of Public Works and regional Trails and Recreation Committees, we advocate for and participate in the maintenance of existing trails, facilitate new trail links between existing trails, and facilitate new trail projects. The TrailHeads committee has found most people do not fully understand the trail layout of this area. Two preliminary maps were developed to show not only the locations of area trails, but their proximity to each other. And this leads TrailHeads to consider opportunities to develop links between trails, including simply increasing awareness through the maps. With the village of Saxonville in the center of the map above, the reach of this map shows how far one can go while staying on a trail and not relying on streets as part of the outing. The two aqueducts define the east to west reach. The map shows the proposed Natick part of the Cochituate Rail Trail to the south. The northern areas of this map show the Weston Aqueduct, the Boy Scout Reservation, and part of the proposed Bruce Freeman Trail in Sudbury. 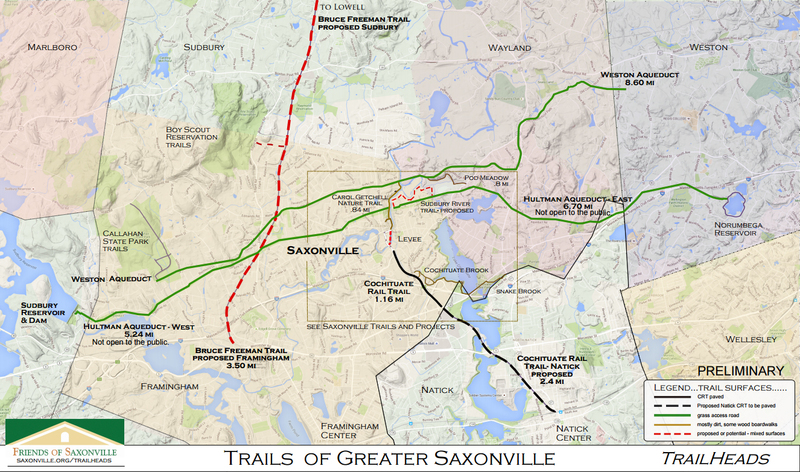 The map above concentrates on trails in the more immediate Saxonville area. Most importantly, it becomes clear how close the end of the CRT is to the start of the Carol Getchell Nature trail. One can use three blocks of Concord Street and one block of Danforth Street to make the connection. Alternatively, the TrailHeads and the Town are considering how to make use of the levee along the Sudbury River to make an off-road connection between the trails. Two other potential trail projects both aim to take advantage of the Sudbury River. Please contact us to share your thoughts! The survey just below is a great way to do this.